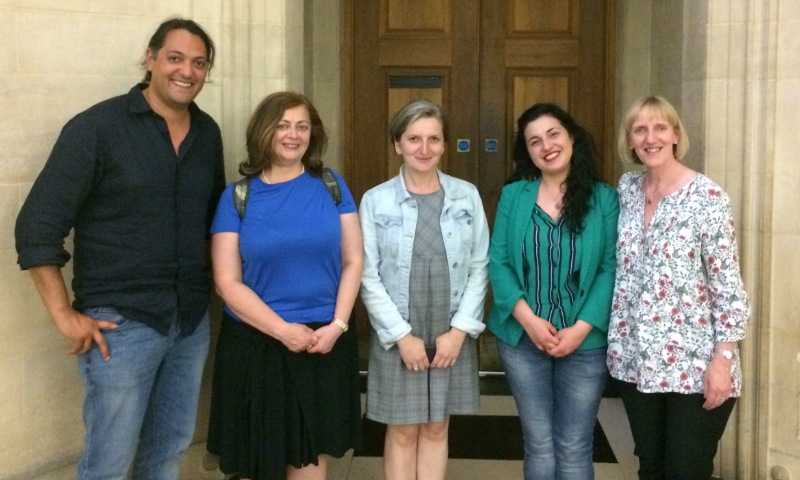 In May this year Georgian Poets Salome Benidze and Diana Anphimiadi toured the UK with their translators, the English poets Helen Mort and Jean Sprackland alongside the PTC’s Georgian translator Natalia Bukia-Peters. This project had a long gestation. Natalia has been working with the PTC as a guest translator for many years and one of Diana Anphimiadi’s poems 'May Honey' had been included in the PTC’s anthology My Voice back in 2014. We have produced three short videos about the tour in partnership with video production company Sixbetween. The first runs through the highlights of our busy week of poetry readings and conversations about translations as Diana, Salome, Helen, Jean and Natalia crisscrossed the country to events in Glasgow, Norwich, Bristol, Manchester, London, Edinburgh and Falmouth. The second two videos focus on our poet pairings. For the first event of the tour, we went to the Glasgow Woman’s Library for one of their lunchtime readings. This is where Salome and Helen met in person for the first time. They sat down and enjoyed some Tunnock's Teacakes together and Salome revealed the light marshmallow inside the English snack is called ‘bird’s milk’ in Georgian. We also paired Diana Anphimiadi with Jean Sprackland. Their first events together were in Norwich, where they were part of a conversation about translation hosted by The British Centre for Literary Translation followed by an evening reading at The Book Hive in Norwich town centre. Our Georgina translator Natalia Bukia-Peters played a key roll in the tour, she helped introduce the PTC to Diana and Salome’s work, produced the bridge translations and worked with our UK poets to unknot the tricky aspects of the translations to produce the poems that were read during the tour and fill our two Georgian Poetry Chapbooks. She also had an opportunity during the tour to once again be the guest translator at a PTC workshop where we translated another Georgian poet Lia Liqokeli.